Today's blog is brought to you by the letter 'T' This was the last letter completed (although I am still fiddling with the letter 'O') because I knew I wanted to use inspiration from John Hensel's Book of Ornamental Knots but misplaced it a for good long while (sadly there seems to be distinct theme there). Using one of the epaulet type knots (will look up and correct later) for the crossbar merged with the infinitely extensible prolong knot for the stem, it ended up looking pretty much as envisaged. It felt quite like mathematical knotwork when pulling and stretching the cord during stem construction. Somewhat Celtic in flavour, it would be more Celtic if there were some sharp corners at the top of the letter. Wonder if I should sew some in. As the whole thing is quite malleable, the stem can widen or lengthen depending on how you smoosh it around while you are fiddling with it. I still haven't decided if I want to fix that down as well. 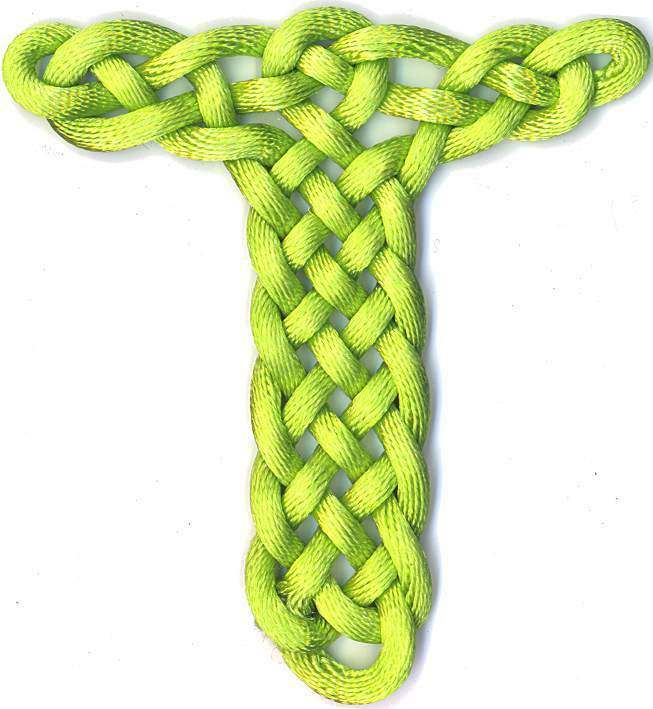 what type of knot is used to make the stem of the T? Where can I learn to tie such a knot? Please email me at Sara@melodyehsani.com Thank you so much! Sorry for not getting back to you sooner. Most of the comments are spam, so sadly I've been ignoring my comment notices.